If you know Dave Fortier you know he spends a lot of time in the shop, fiddling with this, improving that, and modifying the other thing. Not just iceboat related stuff either- maybe you’ve seen the bridge/tunnel/aqueduct his goldfish have to swim through to get fed. Or his swiveling wood stove. Or the iceboats he’s put together over the years…. Well he is at it again and checks in with his new gizmo for carrying two runners in a three runner bag- Check it out! 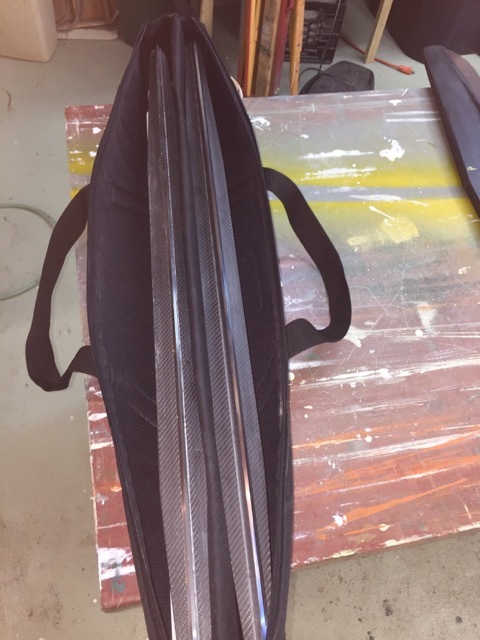 I have adapted the 3 blade bag to work with runners that have built in stiffeners. I built the modification out of PVC board, glued together with PVC pipe dope. Thought this might interest some hardwater sailor in the house. Thinking Ice! This entry was posted on 10/02/2016 by Commodore James "T" Thieler DN US 5224. It was filed under 2016 Season .